Ahhh, this baseball team is really interrupting my schedule! But I love it and they are having such a great time AND doing well, I'm sure I'll survive! Only one month and everything will be back to normal. ☺ Hang with me! I have a couple of cards here to show you that use more of the new stamp sets. Accessories: Razzleberry Lemonade DSP, Rich Razzleberry Polka Dot Grosgrain Ribbon, Stampin' Dimensionals. And yes, I added wings to the owl with the Scalloped Oval Punch...he needs wings! The background is made with the Weave Texture Plate & Big Shot then I sponged over it with a little More Mustard ink. This is the new Wish List I'll be adding to my sidebar (bottom right hand column) for you to print and use with your new Stampin' Up! catalog. Print it and get ready for the FUN!!!! Thank you to these lovely ladies for nominating me for blogging awards. Love your cards! I know what you mean about the owl. He really does need something. Another gal added a tail so he looks like a cat. Love your cards! The animals are so cute. The cupcakes look terrific in those colors. Hang in there, Mom! You'll just have to put diamonds on your cards for another month! LOL! Blessings to you! too cute becky!!! love them both. I love the added wings on the owl! I have that set too, and also felt he was lacking something. Thanks for the idea! 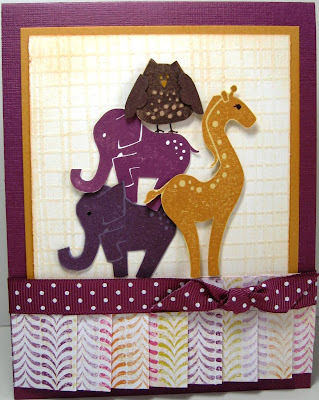 I absolutey, positively LOVE the card made with animal stories stamp set and the new DSP & ribbon. GREAT cards, Becky! It's so fun to work with new stuff, isn't it?! 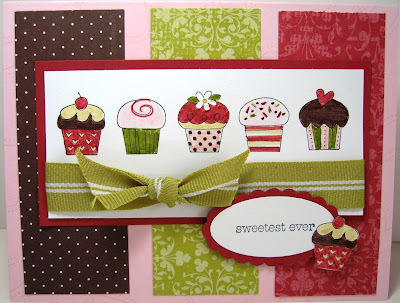 The cupcake card really catches my eye! You just amaze me! Is there no end to your talent and creativity!? He really does need something. Another gal added a tail so he looks like a cat.